No doubt strawberries are the queen of fruits. They have a unique sweet and savory taste. Strawberries can be used for making a variety of dishes. Mostly, they are used for making delicious desserts. 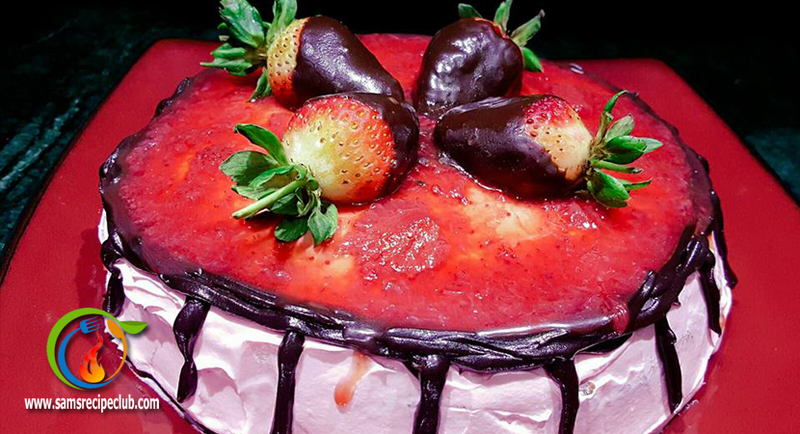 Strawberry cake is full of strawberry sauce and its chunks. 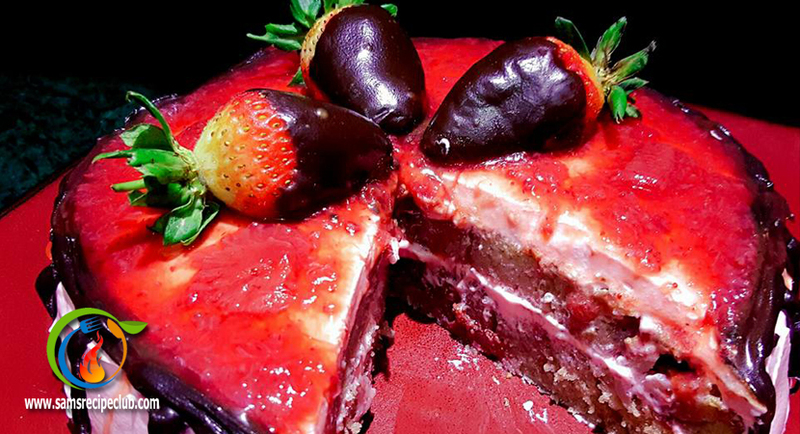 Here, we are introducing an amazing recipe of strawberry cake. We are sure; you are going to love this cake. Follow the recipe and leave your lovable comments. Preheat the oven to 350 degrees. Butter a pan and set aside. Take two bowls and separate egg yolks and egg whites. Whisk together the ground sugar, melted butter, egg yolks, baking powder, strawberry chunks and red food color in a bowl. Also add milk to bring a smooth consistency. Whip the egg whites to make thick foam. Now mix the egg whites into the cake batter. Pour the batter into the pan. Bake in the oven for 25 – 30 minutes or until a toothpick inserted in the center comes out clean. Cake sponge is ready. Combine all ingredients in a pot and cook them over medium heat for 20 minutes. Mash the strawberries with spoon while stirring if required. Set it cool on the room temperature. Strawberry sauce is ready for cake topping. Slice the Cake Sponge into 2 layers of equal thickness. Now moisten the cake halves with sugar syrup to make it wet and soft. Take chilled whipped cream (not frozen) and beat it until it becomes fluffy. Add red food color and strawberry flavored tang. Mix well. Now apply whipped cream over one slice and strawberry sauce over another cake slice. 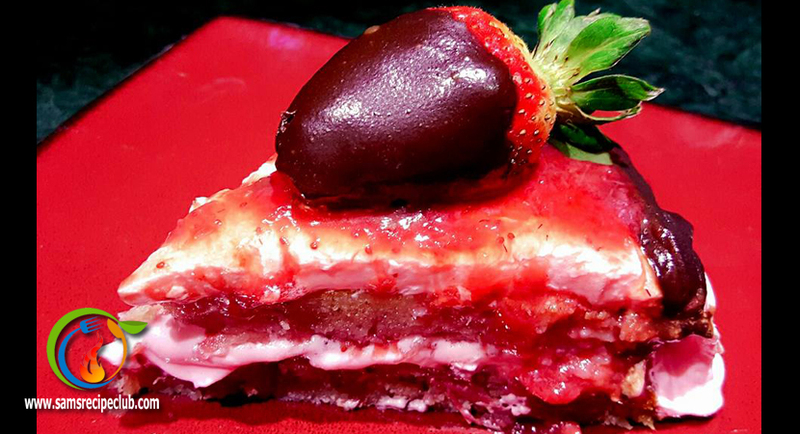 Now join both of the cake sponge halves in a way that whipped cream and strawberry sauce is sandwiched between them. Cover the cake sponge completely with the whipped cream. Level the cream with a knife. Now pour the strawberry sauce over the cake. You can also use chocolate syrup for decoration. Put chocolate covered strawberries on the top to make it more beautiful. Strawberry Cake is ready to serve.